I am in love with old trunks. Just yesterday there was a fabulous one at auction, but unfortunately it went too high for me, and also there is the problem that I have given myself a stern lecture. As I plan to move to Georgia in hopefully less than a year, and I will have to move what I have here in Kentucky as well as what I have in storage in North Carolina (and who knows what is actually in there) I need to start downsizing here. So for right now I am dreaming of old trunks, which are wonderful for storage in small spaces. They also have the added benefit of looking fabulous. Double duty certainly works for me. If you have unused space under a staircase, this is a wonderful idea. The space isn't tall enough for a closet, but the trunk fits perfectly. Many old trunks have ribs on their tops so adding a piece of glass works perfectly to give it a smooth surface. There never seems to be enough extra seating in a small space, but add a cushion to the top and some throw pillow to the back and you have a place for your guests to sit. This is certainly a clever idea. This old trunk has been set on a base and is being used as a bar. It would also work as a sideboard or a vanity. 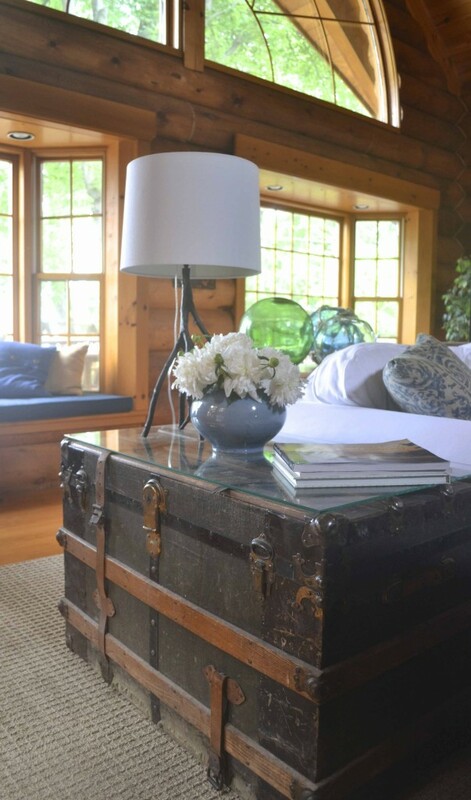 And of course we all know that old trunks make perfect coffee tables. 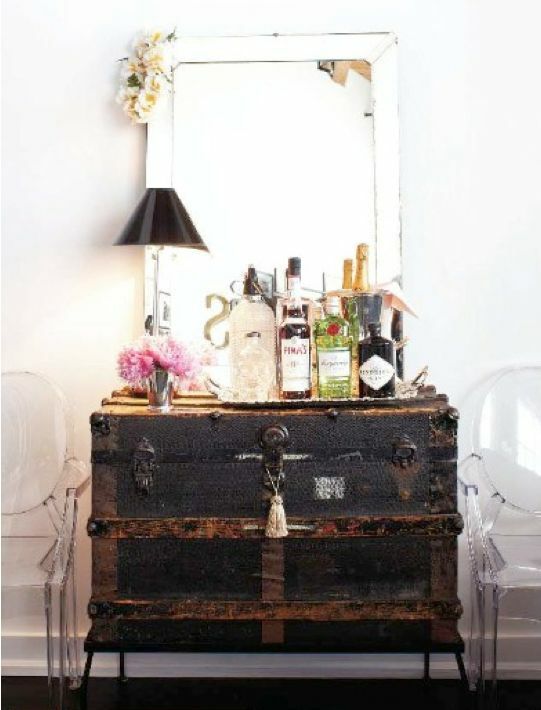 Do you use old trunks in your decor? P.P.S. And there are even more ideas on my Small Space Living board on Pinterest here. P.P.P.S. 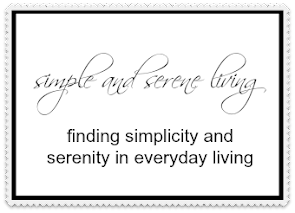 Don't forget to watch for my new URL soon, when I will be changing to Simple and Serene Living. Oh, I'd love to have that last wooden one! As you know I'm using a trunk for my coffee table, storing quilts inside. But mine is not wood, and not in very good shape. And I paid $85 for it right after I moved to Tulsa! Hate to think what that wooden one would cost. The beautiful wood one I saw at auction yesterday went for $45. It's good place to get one. I have an old cedar chest I found at the GW for $20 and I love it for storage. It sits in front of the window and is Charlie's look out place and where I put some plants! 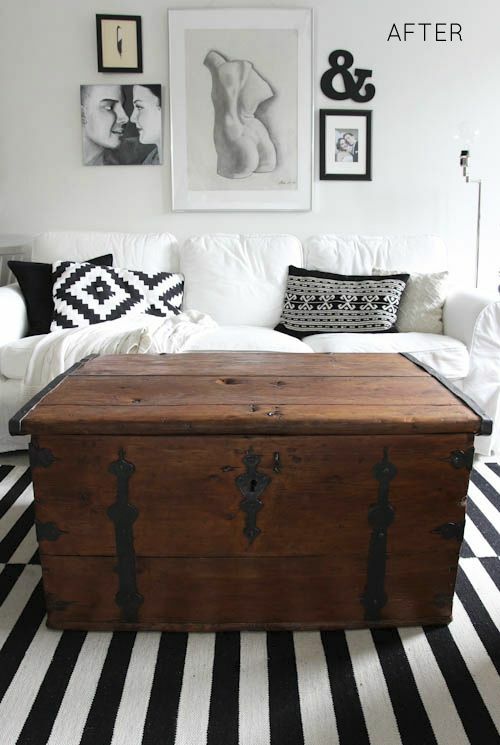 I love the old wooden chests, I'll keep looking for a good one for a good price. 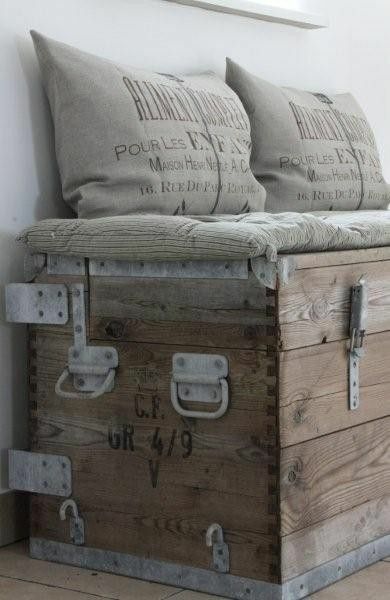 Your inspiration for using old trunks is fabulous!! I never thought of using one for seating...brilliant! Isn't that a great idea, Mary Alice. I had never thought of it either. Loved seeing your uses of old trunks, I recently treated myself to an iron antique trunk, smaller size, a few dents and great patina. But I'm waiting for Spring to take it outside and throughly clean out the inside of it. Thank you for your visit to my blog and leaving a comment. I look forward to reading your past posts. Your trunk sounds wonderful, Vera. I think they have some good tips on Pinterest to get any smells out of old trunk and suitcases. I adore old trunks and have several around the house. I love the images you selected. I had two trunks that I placed in my basement when we built but after loosing my mom and dad in a short time my perspective on family things changed. I searched for someone who would take on the challenge of restoring both of them. Not far from me, he even came and looked at them and told me he could restore. I got them back after 9 months but worth it!!! They both are from my family who came from Ireland and Norway. I took some of the money my parents gave me and so glad I did. I like your blog so much, please continue to share your life with us.